25.0 lb. x 0.005 lb. 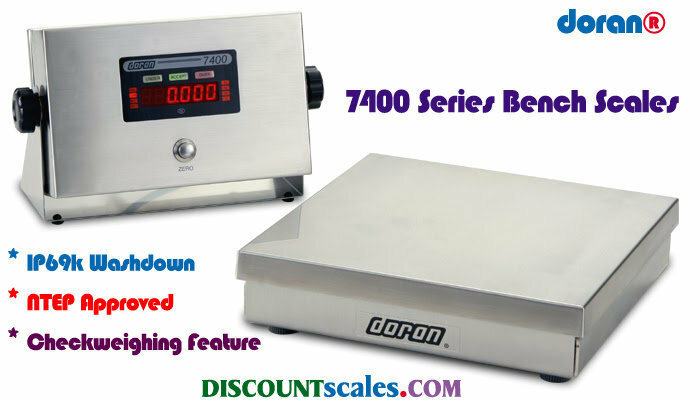 Superior washdown protection has been engineered into the Model 7400 stainless steel checkweigh scale. From the heavy gauge stainless steel to the innovative gasket design, this scale meets the NEMA4X and IP69K classifications for washdown protection. Simple, one-button operation. Press Zero and the bright red LED displays 0.00. Over-Accept-Under indicators can be used to check if the product being weighed meets a target weight. Our engineers designed the 7400 to survive the harshest industrial environments with maximum reliability. The gasketed four-screw case, the stainless steel Zero button, and a watertight LEXAN® lens help achieve that goal. Really. 1000%! Our unique "Quad-Spring" design protects the sensitive load cell from shock and overload damage. Protected to a maximum of ten times the base load rating, this design sets the new industry standard�a feature available only from Doran. Take a "peek under the hood" to see what's inside our DXL scale base. Take the 7400 to new levels with the enhanced features made possible with the new Excel Series Design. Choose from a variety of communication options that include Wired or Wireless Ethernet. Control a mixing or batching operation simply by adding setpoints and relays.